Venue : Old conference hall, TISS Main campus, opp. Deonar bus depot, Mumbai. As a measure to strengthen the union and its members a workshop on “Trade Union education” was organized by our Union. More than 60 members of the union participated in this workshop. Eminent Leaders and professionals from the trade union were invited to guide the participants about the different aspects in the union field and thus educate them. There was a brief introduction of each distinguished guest by office bearers of SWU and after that, Mr. Girish Ashtekar – (General Secretary – SWU) felicitated the guests with a tree sapling. Adv. Sanjay Singhvi (General Secretary – TUCI) commenced the session with history of trade unions and how the different Acts came into existence till the current status of the Acts and Laws. Mr. Singhvi presented story wise PowerPoint presentation of Union history. He made a point when he said that whenever in history a law or Act was made, there was an agitation prior to it. Prof. Sharad Sawant (TISS) was invited to speak on recent amendments and challenges to the Trade Unions. He explained in detail the amendments that are proposed in the labour laws in India. He said that amendments are inevitable and workshops of this type are very necessary so that we can accept the amendments while securing our interest and rights. He suggested that Union should suggest the changeswhich will be advantageous / to safeguard the interest of the working class. Mr. Vidyadhar Rane (General Secretary – ASSRGWA) shared his success story of building the first ever Union of the workers of ship breaking industry in Alang Gujarat. He also said that we should change our perception towards any problem. Instead of repeating the fact that only 7% of the workers in India are organized and 93% are not organized, we should see it as an opportunity and find means and ways to organize them. He explained the situation prior and after formation of the Union. Bro. 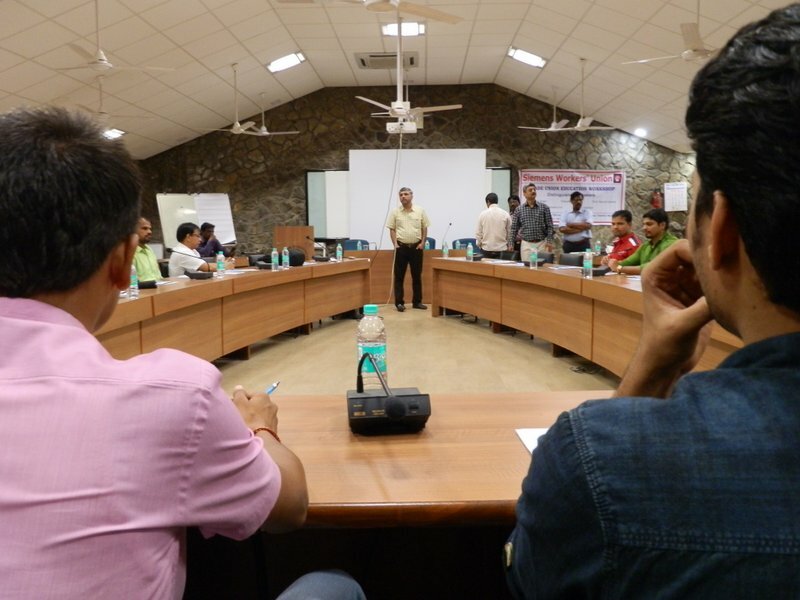 Rajendra Giri (MKS) explained the participants about the need of trade union education and its benefits. He said, more and more people in the trade union should be educated so that they can understand various issues properly and they can negotiate effectively with the management and subsequently provide good wage settlements and service conditions for its members. Union must plan yearly programme for Trade Union Education. The last subject of the workshop was of Dearness Allowance and Mr. Arvind Nair (HLU) explained the Dearness Allowance right from when it was introduced in 1917 as “Dear Food” Allowance till the existing system of DA as per the CPI of different regions in India. He also explained the calculations for DA with examples. He further informed all participants if need felt by you or your Union then he is ready to hold same session in future. In the end a group activity was carried out among the participants by giving them different tasks and the participants discussed among themselves in carrying out a SWOT analysis of SWU. Mr. Girish Ashtekar announced that such workshops will be organized in the future to cover more members. All the participant members shared their experience about the workshopand also thanked the committee for arranging the workshop and promised to share their experience with other members on the shop floor. The workshop was concluded after the National Anthem.